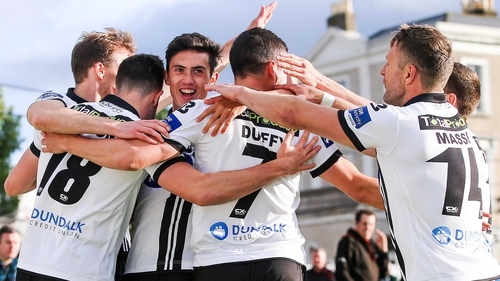 Last year's odyssey gave Dundalk a taste of adventure in "some of the great cities in Europe", according to Stephen Kenny - but with those games in the history books, the Lilywhites are now aiming to write a whole new bunch of chapters. Last year their dreams of becoming the first Irish club to qualify for the Champions League group stage ended following a 3-1 aggregate defeat to Legia Warsaw at the play-off stage. That loss only sparked a fresh journey as they were catapulted into the Europa league, where they went toe to toe - and held their own - with more of the continent's big guns. Now, Norwegian giants Rosenborg stand in their way in the Champions League second qualifying round. Kenny is not overawed. "The players are playing well at the moment," he told RTÉ Sport's Tony O'Donoghue. "Obviously we’re going up a level with Rosenborg. Every player they have more or less has been capped by either Norway or Denmark. They are a formidable side. "They’d expect to get to the group stages really. For us, it’s a tremendous incentive to have the match in Dundalk. Last year is history, but the players got great experience from last year – 12 epic games in some of the great cities in Europe. "That gives you a taste for it. The opportunity exists again for more. We must not limit ourselves in the way we think and we must go and try to pull off another big victory." While, the hosts have a full squad to choose from, with Stephen O'Donnell back after a hamstring injury, Rosenborg include former Arsenal striker Nicklas Bendtner in their ranks and have scored 11 times in their last three league games. Their ability won't catch Kenny off guard, but he insisted the Airtricity League Premier Division outfit will commit to the passing style they've become known for. "They’ve had a great pedigree over the last two decades," Kenny added. "They've been more often than not been in the group stages of the Champions League and the Europa league. It is a tough opposition for us but we’ve prepared very well. I feel we’re quite ready. "We’ve got play our natural game. Our form in Europe and at home has been based on keeping possession and players expressing themselves. We’re not looking to play in the right areas of the pitch, we’re looking to play in every area of the pitch. Every area is the right area as far as we’re concerned."